Rain gardens are an easy and effective method that can be used to help reduce the impacts of stormwater runoff. These gardens are strategically placed to intercept pollutant laden stormwater until it can be fully absorbed into the ground. Stormwater is rainfall, snowmelt, or irrigation water that runs off hard surfaces and across land or into pipes and flows into streams and local waterways. This runoff essentially “rinses off” the landscapes where it falls and can carry pollution that impacts stream quality, and since there is minimal infiltration the runoff can increase local flooding. The specific rain garden design serves as a collection point for water as it flows overland, typically down a street or parking lot. Once collected the water is then able to slowly infiltrate into the underlying soil. Rain gardens come in all different shapes and sizes and work well with native plants that are indigenous to the southwest. These plants require little maintenance once established and their deep roots soak up lots of water. The area provides food and habitat for wildlife and can be impressively beautiful. Rain gardens are an attractive green solution to reduce storm water pollution and improve overall water quality. 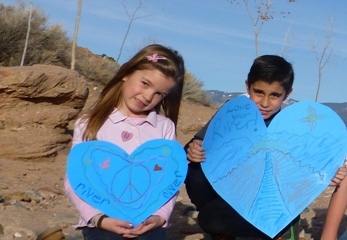 These aspects are an important step in addressing the health of the Santa Fe River. Simple solutions through stewardship add to the river’s standing and value in our community.